Easy to learn program makes recreating Early Music easier. Click here to go to MuseScore's home page. As many of my friends who love to perform songs from long ago around a campfire, I have very little training in music. I can slowly hunt and peck on a piano, and play a few chords on the guitar. Learning new songs from notation was always frustrating if not impossible. I had to hear the song before I could learn to sing the tune. So I confined myself to learning songs from albums and other bards. I would flip through my songbooks of madrigals, ballads, and bawdy songs wishing that I could sing these tunes that looked so intriguing. All of my books were filled with tunes that had wonderful name like "Waggle Taggle Gypsies-O" and and "Twa Corbies." Eventually I was able to find many of the songs on the Internet but not all. I bought a midi keyboard and some software. Unfortunately, it was written for music experts not beginners. I was looking for some Christmas music last month when I stumbled upon a new program from Source Forge, an open source software platform. It was called MuseScore and it was free! And I'm not talking just for 30 days-but really and truly free! pulldown menus or keyboard shortcuts. I downloaded the program expecting something akin to a phone app that makes little ringtones. However to my amazement it was a very sophisticated, full-featured program that was also extremely easy to use. I spent an hour reading over the handbook and watching the how-to-videos at MuseScore.org and started working on a song I had written in my head but had never put into notation. It took only a couple hours for me to get the whole melody written, using the keyboard on my laptop. I think it may have gone faster if I had a midi keyboard. The program was extremely intuitive. Whenever I wanted to move a note up or down a step, I could do so just by highlighting it and pressing the up or down keys. If I wanted to repeat a passage, I could copy and repeat. If I wanted a note or a string of notes sung one octave higher, all I had to do was highlight the notes and press the up arrow while holding down the control key. 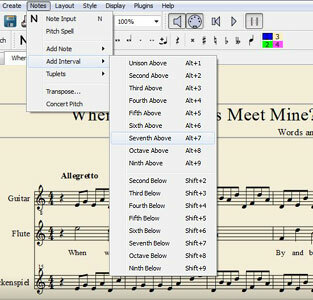 MuseScore allows you to listen to the notes as you edit. You can also play the tune from the beginning or just listen to a part of it. This instant feedback makes it very easy to know immediately if you have the right note or not. As I became more comfortable with the program I started experimenting with more of the features. I added instruments to the basic piano. Most of the insturments sound fairly acurate. The synthesized voice sounds like "Ahhh" or "Ohhh" and though it can't sing words (even when I added lyrics under the melody line) it proved helpful for adding harmonies and counterpoint. I was amazed because I was doing things I had never even been taught how to do. This emboldened me. I experimented with the tempo, changing it from "Allegretto" to "con Brio" to "Largo" and other speeds. I added arpeggios and crescendos. I was getting heady from the power. It was like having a roomful of musicians that I could command with the flick of a finger. I wanted to see what other composers had done with this program so I visited the forums on MuseScore.org. Music students, professional composers, and songwriters have posted their compositions on the forums so others can download and listen to them. Some are full orchestrations with violins, horns, woodwinds, and drums. Some are just a melody line. The forums are also good for troubleshooting and tips. The program is open source, so it is never completed. It is a work in progress by a great number of people. It is still a little buggy and quits unexpectedly at times, but you can restart it in a blink and it recovers right where you left off. I shared this program with some bardic friends who also got excited about it. They saw how easy it would be to use it to learn historical ballads and, best of all, we could use it to preserve the tunes to the old filk songs that are nearly forgotten.We are also taking well-known songs and creating harmonies and arrangements that we can perform together. Once we have them in MuseScore we can output them as pdf files for print, .wav files for listening, midi files, and many more formats. We are beginning to work on a songbook of our favorite SCA songs. It looks like this project will be on-going and will be a lot of fun. When Will Thy Lips Meet Mine? An original composition by the author for guitar, voice, and glockenspiel in MuseScore midi format. See if there is one near you! It's more fun to GO IN GARB! If you want to add this article to your list of favorites or email it to a friend, please use this permanent URL, https://stores.renstore.com/-strse-template/11JanB/Page.bok. Permission is granted by the author to quote from this page or use it in handouts as long as you include a link back to Renstore.com.